The above video demonstrates a simple, but effective, taping to limit motion in the big toe joint (first metatarsal-phalangeal joint). Kinesio Tape is used 1" in width and 8 inches long. For painful problems like turf toe, Hallux Rigidus, Hallux Limitus, sesamoiditis/fractures, and bunions this taping can prove helpful. I look at it as I would an ankle brace for a sprain. There are various versions that can be tried, but the most common technique is demonstrated. 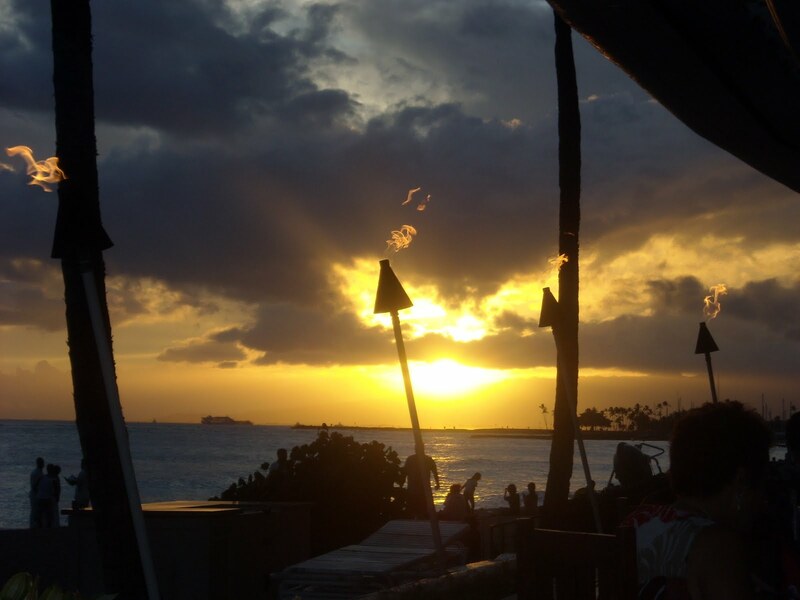 Hello, I am back from Hawaii and ready to get blogging. Thank you followers (now up to 34!!) for allowing me the 10 day hiatus from blogging. The break was needed and Hawaii unbelievably beautiful and restful. I am writing today because in conducing online research about my injury, I came across your healing sole blog, and you offered your contact information so that folks might contact you with foot-related concerns. Thank you for extending yourself in this way. I could not find anything on your website about my particular injury, and so I thought I would write you. I have seen an orthopedic surgeon and a podiatrist, but I'd like to have another opinion. Also, I find it very difficult to get answers out of these doctors, as they only have a few minutes scheduled to talk to me. I am a 29 year old female. I started dancing in college (modern and some ballet) about 8 years ago, and have continued on and off since then. I took some time off, but started taking classes about 3 - 4 days per week in July 2009. I am not a professional dancer, but have received scholarships for dancing at my studio, and have been involved in pre-professional training programs for modern dance. It is very important to me. 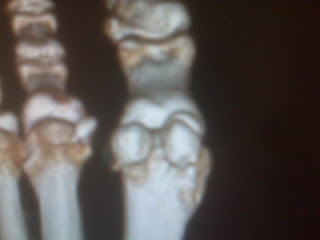 In about September 2009, I noticed some pain in the left ball of the foot. I stopped dancing for 1 week and it got better, so I resumed. However, the pain returned very gradually. I visited a sports medicine orthopedic doctor in February 2010 for a different concern (right ankle stability), and also mentioned the pain in the left ball of the foot. He diagnosed it as "sesamoiditis," and seemed confident of his diagnosis, so I declined an x-ray. I avoided jumps in dance classes as I had been since the onset of the pain, but I continued dancing. The pain very gradually became worse. At the end of May 2010 I decided to stop dancing and seek physical therapy, as the orthopedic doctor had said this was an option. After three sessions of physical therapy (involving ultrasound, iontophoresis, soft tissue mobilization, taping and home exercises), my foot was much worse - it was swollen and painful to walk. Prior to this, my main pain came from dancing, not walking. At the beginning of June 2010, I went to a different orthopedic surgeon and he took x-rays, diagnosing my injury as a non-union fracture of the fibular sesamoid. (A pre-injury x-ray from 2008 ruled out bipartite sesamoid.) I was in a walking boot for the month of June and non-weight bearing (on crutches) beginning in July. Upon recommendation from a friend and family doctor, I sought a second opinion from a podiatrist. The orthopedic surgeon said that if my bone wasn't healed by the end of August (after 8 weeks non-weight bearing), it would require surgical excision of the fibular sesamoid. The podiatrist has been more conservative in his treatment. 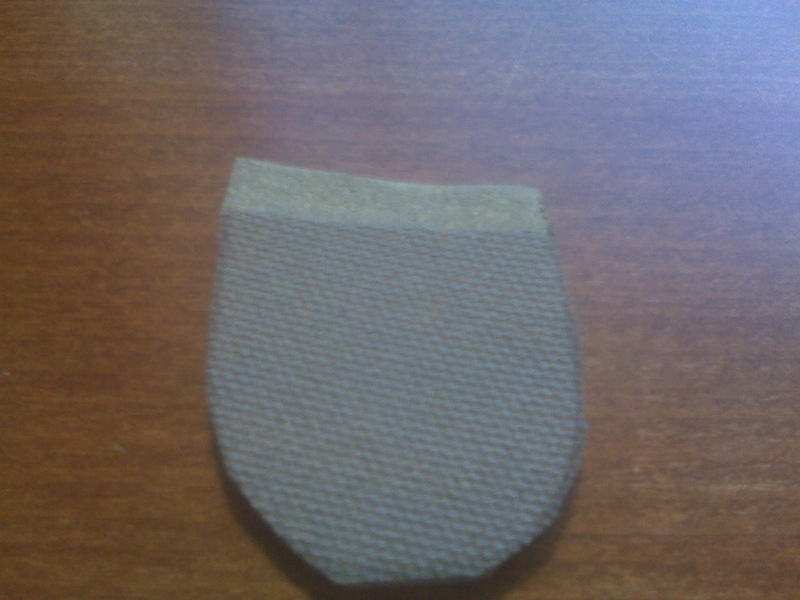 On August 18, I began using a bone growth stimulator once a day for 30 minutes. It is the DonJoy Condensed Magnetic Field (CMF) stimulator. After my 4-week check-up on September 8th, the podiatrist added a twice daily contrast bath to my regimen, along with the bone growth stimulator. I will see him in another four weeks. I am still non-weight bearing, and I have been conscious to take calcium supplements, drink milk and eat yogurt this whole time. http://www.youtube.com/user/drblakeshealingsole#p/a/u/2/rRt5hC24Afg for information on contrast bathing. 1) Is there anything else I should be doing to heal this bone (without surgery)? 2) I am a very patient person and would do anything to save my bone rather than have it surgically removed, as I fear it will compromise my dancing. However, is there a point at which we can be fairly certain that the bone won't heal, and I will have to resort to the surgery? 3) What risks would surgical removal of fibular sesamoid involve? Again, my main concern is with the function of my foot - I am very active and want to be able to dance for the rest of my life! I read on the Internet that removal of the sesamoid affects a persons balance and power, may lead to hallux varus as the tibular sesamoid loses its counterbalance, and may affect the tendons (adductor hallucis). My concern is that the doctors all tell me the surgery has no effect and I will be back to normal. I am a smart woman who has done her research and recognize that this isn't the case. Could you please provide me with an honest, realistic representation of what might happen over the course of my lifetime as a result of sesamoid excision? 4) Is arthroscopic surgery an option? 5) Are bone grafting or pinning options? 6) I have struggled to trust my doctors. What do I look for in a surgeon (if it comes to that)? Should I go with a podiatrist or an orthopedic surgeon? 7) When I get back to dancing, how can I avoid future injury to the fibular and tibular sesamoids? I realize that the impact is greater if both sesamoids are removed, and want to avoid that at all costs! Dr. Blake, I apologize this is such a long email. I hope you are able to offer me some advice. Thank you for your help. Dear Jenni, I will try to answer your questions in this blog posting. There are 2 sesamoid bones under each first metatarsal which make up the "ball of the foot". These sesamoid bones act like the knee cap in function: they protect the first metatarsal from direct pressure, and they separate the tendons from the joint axis increasing the lever arm of these tendons. Increased lever arm means increased power from these tendons which need, at times, to handle the force generated up to 5+ times body weight. The photo below shows these sesamoids sitting under the first metatarsal with the fibular (closest to the second metatarsal) having a fracture. 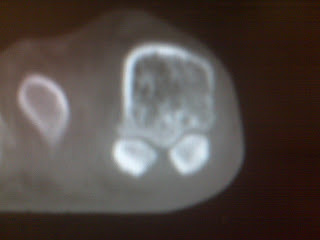 In this example, you can clearly see how the fibular sesamoid looks irregular. The actual fracture occurred 10 months previous to this fracture. At times, the sesamoid bones never completely fuse in adolescence, and so xrays show that they are in 2 (bipartitie) or 3 (tripartite) pieces. The photo below shows a non painful bipartite tibial sesamoid. Fractures can be misread on xray as bipartite or tripartite sesamoids (false negatives), and bipartite/tripartite sesamoids can be misread on xray as fractures (false positives). 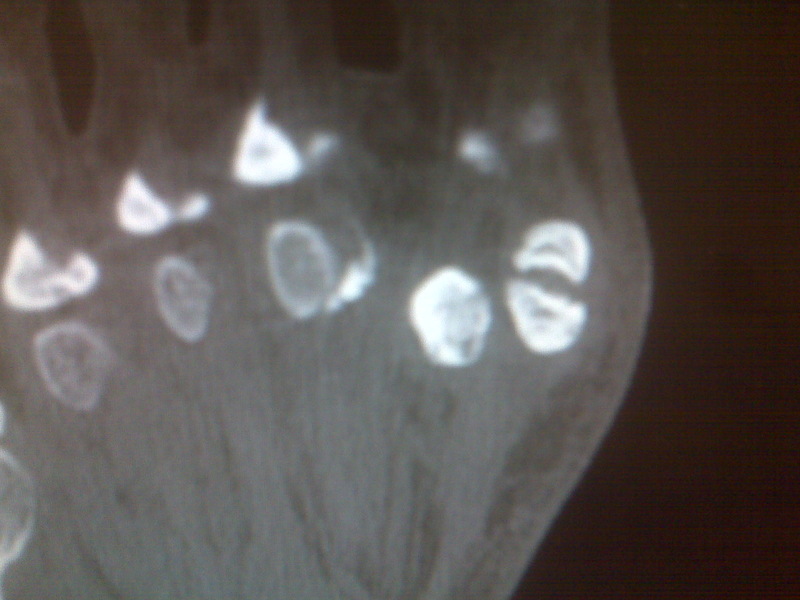 Bone scans or MRIs clearly make the diagnosis of sesamoid fracture when not completely obvious as in the photo above. On an aside, ultrasound is contra-indicated for stress fractures, probably why physical therapy aggravated the situation. Golden Rule of Foot: If ultrasound irritates the injured area, consider an underlying fracture may be present. I will try now to answer your questions. #1 Is there anything else you can do to heal the bone in an attempt to avoid surgery? First of all, anything that you do now to help yourself avoid surgery, even if you need surgery, will help you post surgery immensely. This is a perfect time when the bone is sensitive to design perfect orthotic devices that protect them. These modifications in orthotic devices are a post in themselves, but most sports medicine podiatrists and physical therapists can design deceit orthotics for this problem. You may have a biomechanically challenging foot, with a very prominent first metatarsal and this could actually take the work of a biomechanical expert (hope this is not you). The goal of any othotic device for you, and athletic shoe ones are made first to wean you eventually from the boot, is to shift weight back onto the arch and onto the 2nd and 3rd metatarsals. Without a corrective orthotic device, at some point in each step, 100% of your body weight goes through the big toe joint and sesamoids. 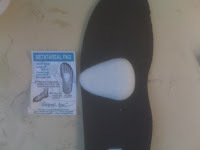 In the front of the orthotic device is a "dancer's pad", also called a reverse Morton's pad, and sometimes an additional metatarsal pad. 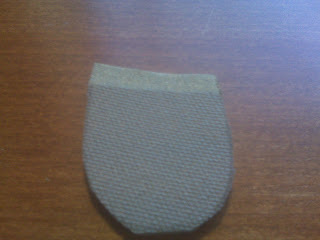 Here an additional met pad is used to shift more weight off of the sesamoids. The bone stimulator for a nine month period is great, just do not stop it too early. If you are using the bone stimulator, best to be committed to it for 9 months. Remember, pain is going to be a poor guide on healing. As you continue non weight bearing, the area will get stiffer, weaker, more swollen, and with more bone and nerve sensitivity. You are in the easy stage of rehabilitation. It is getting you back on your feet gradually that the work begins. The doctor managing your care will need to balance the pain you have with a gradual increase in function. It can be a trade off to allow more function with some more pain initially. This is the same issues that have to be dealt with post operatively. 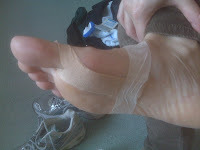 Learn to do spica taping to restrict big toe joint dorsiflexion with kinesiotape. The 3 photos show the placement of 1" kinesiotaping. It should be applied easy, not to pull the toe down, but to restrict the upward motion of the toe. It should not feel like it is tight or jerky on the toe. You can experiment with longer arms of the tape under the arch. 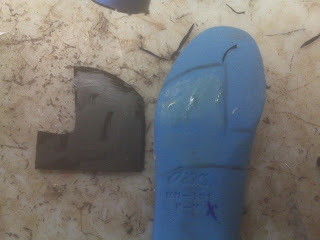 The 1" tape is split in 2 for 1" to wrap around the toe. An upcoming post will show a video on this technique. Stay strong with all those foot intrinsic muscles, but also you knees, hips, and core. The stronger you stay, the faster you heal, surgery or no surgery. The weaker you become, the more collapse of your arch into the ball of your foot, the more pressure on the sesamoids. You are in the Immobilization Phase, but you need to be blending the Restrengthening Phase into it. You need a smart physical therapist to begin restrengthening your body. Golden Rule of Foot: Begin Restrengthening the Injured Area even before you injure it. Get a Vit D 25 level now, and a bone density screen, to make sure everything is perfect in those two areas. You should be taking 1500 mg of calcium (normally 5 daily servings of calcium rich food, or you can supplement diet with 500mg sugarfree TUMS at the end of each day to make up the difference. Papertape is used to secure the arms when they begin to loosen. Make sure you stay with a relatively painfree environment (see link to post on Good Pain vs Bad Pain) as they wean you from non-weight bearing to a weightbearing removable cast, then removable cast to athletic shoe and orthotic and tape, to smaller orthotic with dressier shoes and tape, to dance shoes with dancers pads and Hapad archs and tape, to gradually return through the various levels of difficulties in dance. Spenco is glued to the bottom of a shoe insert as a dancer's pad. #2 When are you sure that the bone needs surgery? Sesamoid on CT Scan shows irregularity at the interface with the bottom of the metatarsal head that you know will break down the metatarsal head cartilage over time and cause a worse problem. This is the case of the patient with the xray above when I first met her. I knew at 30+ that she couldn't coexist with this for the next 70 years. Surgery is also indicated if the MRI shows damage to the underlying first metatarsal. However, a bone stimulator with serial MRIs may show healing over a 1-2 year period of time. I definitely feel surgery for this injury is an individual thing. You are a candidate for surgery 3 months after your injury. No one would blame you for having surgery. Personally, I would try to perfect all of the factors that could delay or eliminate the need for surgery (diet, strengthening, physical therapy, spica, orthotics, padding, etc.) Anything that you learn before surgery, may help you prevent surgery, but definitely help you in the post operative period. #3 What are the risks, especially in an active person, to remove the bone? When you remove the sesamoid, you can be extremely active at a professional level, but you must always try to protect the other sesamoid for the rest of your life with orthotic devices, dancer's pads, etc. Most doctors underplay the actual time it can take a high level athlete to get back. I believe that there is a 2 year total healing time to a strong and powerful big toe joint following surgery. The first year is all about swelling, initial strength, scar tissue, and biomechanics. The second year is re-strengthening at the level of gaining not tone, but power, endurance, and quickness. And yes, surgery can be have it normal array of problems--excessive swelling, incomplete correction requiring re-operation, excessive scarring causing stiffness/pain, tendon balance problems requiring prolonged taping, and many other issues. Hallux varus is rare, although surgeons know what foot types are prone and can tell you if you are a remote candidate. #4 Is arthroscopic surgery an option? No, the joint is too small. Most surgeons approach the fibular sesamoid from the bottom of the foot for easy access. #5 Are bone grafting and pinning options? #6 What should I look for in a surgeon, and should it be a podiatrist or orthopedist? Sesamoid surgery, or trying to avoid sesamoid surgery as you are, is all about rehabilitation and biomechanics. It is an ideal perhaps to find a podiatrist or orthopedist who does surgery, and also pays alot of attention to the rehabilitation part and the biomechanics part. They do exist, and most create a team in dealing with this problem. Our top surgeon will use me for the orthotic devices and some of the rehab, and physical therapists and trainors for the rest of the rehab. Unfortunately, you also must see your limits with your insurance carrier, but also have a clear understanding from the surgeon about how you will be rehabed. I am biased toward my profession, but surgeons in general only have time to focus on surgery. Find a surgeon that embraces the TEAM approach for the rehab phase, after the surgeons have pronounced you "cured". #7 How can I minimize the risks of re-injury when I return to activity? This is really answered in how can I prevent surgery? Gradually return to dance start with barre work and finishing with grand allegros. Learn to tape your big toe joint. Learn to apply hapad longitudinal metatarsal arches and dancers pads in all your shoes. Make sure your Vit D, Calcium, hormones, bone density, and diet are all great. Learn what shoes are helpful (amount of cushioning, heel height, flexibility or rigidity, etc, can all make a difference) The Golden Rule of Foot with Sesamoids and Shoegear: Follow how you feel, not some general rule--you may be an exception!! Gradually start strengthening your foot, but not through pain. There are so many ways to strengthen an injured area and the body above it. You should be strengthening daily, and keep pushing the limit. You should be biking and/or swimming if you are non-weight bearing, and perhaps doing some thera-band and other foot strengthening techniques. I look at the source of a gout attack from 3 angles (or a combination of all 3): the kidneys for some reason are not flushing out the uric acid from the blood stream well enough, there is a systemic reason for increased metabolism which is producing more uric acid into the blood stream (uric acid being a normal breakdown product of purines), and a recent diet of food rich in purines (which breakdown to uric acid). The link above from gout.com is great at getting us all on the same page. When a patient has a gout attack, any anti-inflammatory medication helps, like Advil, but I prefer to use indomethacin. In a normal size adult, you can use 75 mg 3 times over the first 24 hours as a loading dose, then drop to twice daily for the next 9 days. After these first 10 days, it is obvious how easy or hard it is going to be to get the symptoms under control. Most of my gout attack patients are placed into a removable cast to minimize the bending of the big toe joint, with EvenUp on the other side. The patient is advised to take food with indomethacin since it can be hard on the stomach. Gout attacks can occur from 2 days to 3 + months so you need to treat quickly. Icing is important to both reduce blood flow to the inflammed joint and for pain relief. See separate post on icing (I prefer the slush, but how cruel can I be!!) Patients are told to drink, and drink, and drink water to hydrate, deluting the concentration of uric acid quickly in the blood stream. They must also become familiar with foods rich in purines, and try to minimize the ingestion (not eliminate) on a daily basis. Injections into the involved joint to analyze the crystals seem too academic to torture the patients initially, but if the pain is not subsiding in 4 or 5 days, then aspiration and injection of steriod may be appropriate to reduce the inflammation quickly. Since cortisone takes 3 to 7 days to work, and the acute aspect of the gout attack may naturally be over by then, it takes some sixth sense to know who should have the joint aspirated. Ask anyone with an acute gout attack and they will say that the injection was somewhat draconian!! The blood level goal has always been 6mg/dl, but to accomplish that your primary care doctor is normally reluctant to place you on kidney eliminating drugs for the rest of your life like Allopurinol. So, most doctors prefer to counsel their patients on diet, hydration (the more dehydrated you are, the higher the concentration of everything goes in the blood stream including uric acid), exercise for weight reduction, sensible dieting, and medications to possibly change. This is an email with answer from Brian in Florida. I have read your blog on Morton's Neuroma. I have been suffering with the affliction for over two years and it literally almost killed me. To start, I'm 52, male, in good health otherwise. Non-drinker, non-smoker. My foot pain started in November of 2007 rather insidiously. In January of 2008, I visited a podiatrist who diagnosed the condition and gave me a cortizone shot. This shot ended up causing me tremendous pain for over two months. I was ready to cut my foot off it hurt so much. During this time I researched the condition and learned about all the pitfalls of surgical intervention for the condition. After much research, (MRI, visiting several different physicans) I learned that my condition is caused by foot mechanics. I have what has been described as a hypermobile first ray which directs my weight to the center of my forefoot during walking. I have one neuroma between 3 and 4 on my left foot. Two on my right foot, one between two and three, one between 3 and 4. I have spent literally thousands of dollars on shoes, orthotics, two rounds of cryogenic neuroblation, one by a doctor in Tampa (Dec 2008), a second by a doctor in Phoenix, (Dec. 2009). My symptoms have lessened but I can not stand still for more than 5 minutes without pain, and cannot work standing all day without ending up in a lot of pain. The Cryo really helped my left foot and the neuroma between 2 and 3 on my right foot, but, the neuroma between 3 and 4 on my right foot has really started to bother me again. By the way, when I said that this condition almost killed me I meant it. I had been taking Celebrex to help manage tha pain for over 1 year. (200 - 400 mg per day depending on pain started in 12/08 after the first cryo). In July of this year I was put in the hospital with a bleeding ulcer. This was an expensive ($60,000) event, along with the 10 day hospital stay. My gastroenterologist feels that the ulcer was from the NSAIDS, as I do not have an H-Pylori infection. I need to get this problem resolved. 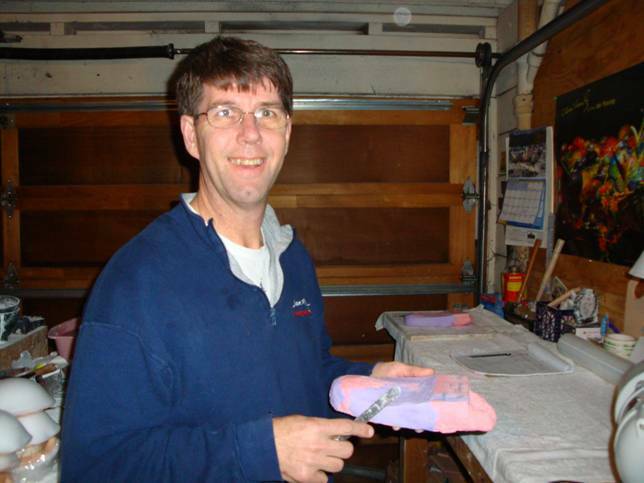 I am trying one last pedorthist for a set of orthotics and shoes that help with my gait. I am considering either one more Cryo attempt, or getting some guts up and going for the surgery. With the mechanical issues that come with my inherited feet (one doctor told me that I just had bad genetic luck ) I wonder what is my best course of action. I prefer the cryogenic neuroblation over the alcohol shots but I am wondering if it is time for surgery. In your experience how common are complications from the surgery, stump neuromas, chronic regional pain syndrome, etc. Would you try something else ? The pain from this condition is affecting my life not only at work, but in my relationship with my family and my over all general health as I can't walk, bike or exercise any more. The possibility of the surgery actually making the pain worse scares the day lights out of me because I don't know if I could take it. Your blog is very informative and it sounds like your approach is very conservative. You seem to be a talented and compassionate individual. I would appreciate any thoughts you have in this matter. Brian, Thanks for the compliments and email. There is so much to discuss from your email, and I thank you for allowing me to answer in my blog post. One of the main reasons I would not go to surgery now, if you have told us everything, is that you need more workup for the source of the nerve pain. I do not think you can ever be sure that nerve pain has a simple source, like a fallen arch, or a hypermobile first ray. 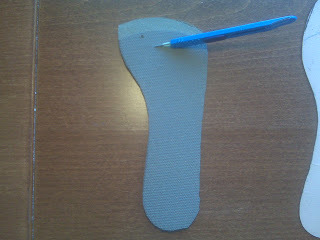 But, great orthotics can help you immensely and must be sought after. There are so many factors when dealing with orthotics and nerve pain that it can take quite awhile to recognize them all and address them all. They include the amount and placement of the metatarsal arch, the flexibility or stiffness of the material around the metatarsals, the accommodation, and exact placement of, for the painful spot, the heel pitch forward, etc, to name a few. Have you been happy with the orthotic people you have gone to, are they analyzing many of these factors? The orthotic support therefore must be as ideal as possible before you venture into surgery, and it may eliminate your need for it. I guess what I am trying to tell you is not to set some arbitrary number on how many orthotics you get before surgery, but to keep trying until at least you feel the guy making them is doing the best for you. One of the key aspects of your condition right now is to regain foot strength. Golden Rule of Foot: For every day you are in pain, it takes another day to get the lost strength back. That is one reason you are on this slow course. Loss of foot strength definitely is allowing the metatarsals to collapse onto the nerves increasing the nerve irritation. You need a skilled physical therapist to triple the strength in your feet over the next year, but the exercises can not increase the nerve pain. Sometimes easy, and sometimes this is a difficult task. Extremely important however. One question all patients with neuromas must ask is why do my neuromas hurt, when some neuromas do not. I have MRIed many patient's feet and found non-painful neuromas, at least the patients say that they have never hurt. I have had patients who come in with neuroma pain for 2 weeks, and when we MRI them, they have some of the biggest neuromas west of the mississippi. Why did they just start to hurt? The neuromas had probably been around for years. The word Neuroma denotes some permanence, a thick scarred swollen tumor. But, inflammation of the peripheral nerves called neuritis, does not show up on MRI, and can hurt just as bad, and require just as much treatment. I think neuritis responds better to alcohol shots, but this is another general rule that may not apply to you. So you need to make sure that your neuromas hurt by themselves and not complicated by tarsal tunnel syndrome, peripheral neuropathy, low back radiculopathy, and other sources of nerve pain. You definitely need a neurologist or physiatrist involved. Nerve Conduction Studies can be very helpful for tarsal tunnel and low back involvement. Nerve biopsy is standard for peripheral neuritis. So, the source of the pain must be identified better. I am not sure why cortisone shots help 99% of patients and aggravate 1%. And when it aggravates, called steroid flares, these patients really hurt for a long time, and they never want another shot again. Don't blame them. Sorry it happened to you. I have no experience with cryo-ablation, but it sounds like it helped 2 of the 3 areas. Sounds like you respond well to it, what have they told you about it not working if you try it again. Was it very painful? What is the downside in your mind? Please answer any of these questions in the comment section of this post. I am alittle unclear if you still have pain in one or both feet. Could you let us know when you have pain during the day, and at what level on the pain scale of 0 to 10? Have you tried a removable cast, with or without an orthotic, on the worse side and does that take care of 100% present of your pain? Have you tried athletic shoes, hiking shoes, clogs, or sandals, and do any of these shoe gear changes help you at all? 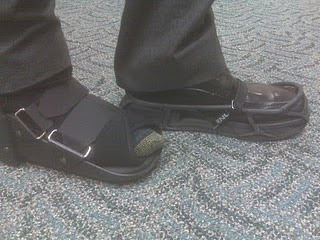 Golden Rule of Foot: Try alternating shoe gear throughout the day to vary the stresses on the injured area. Since we are going to talk about lifts I thought I would give your spirit a lift first. I wish to express my gratitude to photographer/artist Robert Stallard for this breathe-taking view of San Francisco Golden Gate Bridge near sunset on one of our cold, foggy San Franciscan summer days. The heel lift is the main method used in treatment of short legs and their problems. But, heel lifts are inherently unstable, and easy for patients to compensate for by simply bending the knee on that side. Once you bend the knee on the side you are trying to lift, you have lost the correction. Heel lifts, therefore, can make the foot/ankle more unstable by lifting up in the shoe more, and they can make the knee more unstable by producing greater knee bend/flexion. Doctors are always placing the lift onto an orthotic device. This is not advisable. First of all, it makes it hard to decide what symptoms are related to the lift, and what symptoms are related to the orthotic device, when pain increases with orthotic devices. Secondly, because of the instability mentioned above, the heel lift may negate the added stability produced by the orthotic device. Golden Rule of Foot: Keep orthotic devices and lifts for short legs totally separate. Full length lifts in the treatment of short leg syndrome are much more stable and produce better symptom relief. Full length lifts need to lift the heel and forefoot (metatarsal area) equally, then taper at the toes. This full length lift above, designed around a shoe insert template for W9 (women's size 9), is actually cut off at the toes to give room in the toe box area. Imagine all of the athletes who run up on the ball of their feet, but need a lift for their short leg, how could a heel lift do anything positive for their biomechanics and symptoms? At least 50% of the time most athletes are on the ball of the foot while exercising, so a full length lift seems ideal for the athletic population. Now athletes on the other hand would love the lift to be only under the heel for convenience and shoe fit, but it is so much better to have it full length. If you use full length lifts, make sure you make cuts into the material by the ball of the foot to help with smooth push off. This is especially true as you get up over 1/4 inch in lift. Material under the ball of the foot can make it hard to move through, so cutting to increase bend, along with beveling and thinning slightly can all help.You can also see that the front edge of the full length lift is bevelled or skived to make a smoother transition forward. When I am using full length lifts, I always try to get feedback from the athletes on how easy it is to move through their foot. In podiatry talk, I am trying to avoid Sagittal Plane Blockade. Not really demonstrated well, but these cuts do improve the bend of the foot making it easier to move gently through to the toes. There will be alot more discussions on lifts, short legs, gait dominance, and the biomechanics of injuries. Mobilization maneuvers are not the normal motions of a joint. Mobilization maneuvers should never hurt. If they hurt, the joint will be tighter when you finish then when you started. Mobilization maneuvers occur to only one-half of the joint, you must stabilize the other half. These maneuvers involve moving the hallux (big toe) on a fixed first metatarsal. The bone, not skin, must be grabbed on both sides. The big toe has two bones and a joint. You want to grab the bone closest to the big toe joint. Each motion should be done 2 or 3 times only with quick motions as you get good. These maneuvers should be done once daily. Normally, after 50 times, increased joint motions are noted. Some patients will do after a hot shower, or in a warm water soak, jacuzzi, or Bikram Yoga session. If pain is produced with the mobilization, ice for 20 minutes afterwards. You can get further advice from a physical therapist or chiropractor skilled at foot manipultions. I hope this helps you gain motion in your stiff big toe joints from Hallux Limitus, Hallux Rigidus, post bunion repair (find out from surgeon when safe to do), and other injuries to the big toe joint. I hope you have a fun-filled long weekend planned!. 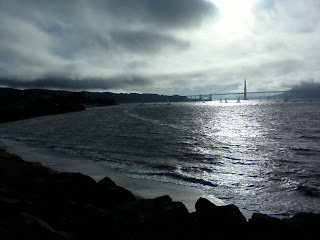 the East Bay, it might be more convenient. PS. During the time you are in physical therapy, you must continue to ice massage 3 times a day (since the contrast bathing did not help), and do as much physical activity as you can without flaring up the symptoms. It is normally a mistake to go to physical therapy at the same time you are resting an injury completely. The physical therapist never gets a good feel of your improvement, or lack of improvement. Use the information on the post Good Pain vs Bad Pain to base your Activity Modification Program. Also, the next step with calcaneal bursitis is cortisone shots, but that requires 2 weeks off activity/shot, and could require up to 3 shots (the response to the shot is evaluated in 2 weeks), so most athletes try to avoid with a passion. Please see the separate post on the thought process behind cortisone shots. Good luck Tracy, email me after 4 physical therapy visits. BikeTheWest Marc Evans will be pledging 2000 cyclists and participants for the 8th annual Tour de Tahoe - Bike Big Blue. 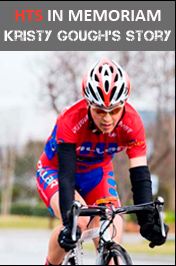 A great opportunity to ride (Sunday) the 72 miles around America's largest alpine lake. Come and take the pledge to obey all traffic laws and honor those who've lost their lives or have become seriously injured. I believe I recall reading in your chapter in Ron's book that chose the arch height in the finished device. I was wondering how you chose the arch height. For those who don't know how an inverted cast is made: A platform is built on the positive cast that inverts the heel bisection. 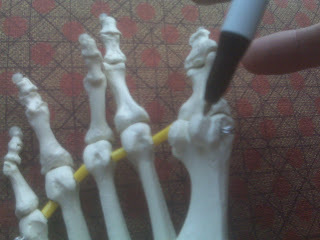 If you take a cast and invert it, this will make the medial arch of the device higher. Plaster filler is added to the arch and then shaped like how the arch would have been had the cast not been inverted. This is a question from the podiatry arena website from biomechanics expert Dr Eric Fuller. I hope for some of my followers this information on the Inverted Orthotic Technique I invented in the early 1980s proves to be somewhat interesting. The Inverted Orthotic Technique is my biggest contribution to the podiatry world and has helped tens of thousands of patients. One of the biggest problems I see in having this technique more widespread is highlighted by Dr Fuller's question. How is the arch height of the Inverted Orthotic Device determined? Once an orthotic laboratory understands the answer to this question, the technique gets simpler to manufacture for other health care providers. Any laboratory can learn the technique and gradually CADCAM systems will make the process alot easier. The Inverted Orthotic Technique is different from a balanced Root or Root Modified orthotic device since a varus cant is placed into the device by inverting the plaster mold a set amount of degrees. The standard is 25 degrees Inverted since it controls pronatory forces better than a Root device inverted 3 degrees with maximal arch height and with a Kirby skive. This was the standard for many labs in the 1990s if they were uneasy to use the Inverted Technique. 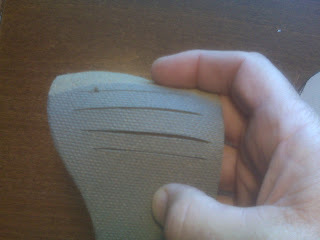 When a patient was still pronating through the orthotic device, the next correction would be a 25 Degree Blake Inverted. This was the next step in correction and therefore a good starting point for utilizing this technique. If the prescribing clinicians were happy with the control of a Root Device with MCC (medial column correction) and 4 to 6 mm Kirby, or extended Kirby, then there was no need to change to the Inverted Correction. The Inverted Orthotic Technique in the world of controlling pronation forces therefore starts at a 25 Degrees Inverted Cant and goes up from there. The higher the Inverted cant becomes, the higher the arch height becomes. I have many posterior tibial dysfunction patients that are functioning well with even 45 Degree Inverted Canting, MCC, 6 mm Kirby and 3/16" polypropylene, and 0 degree extrinsic posts and 25+mm heel cups. You could never attempt such a correction if you didn't solidly know the answer to Dr Fuller's question. It takes a biomechanical expert to ask the question that is at the core of the technique, and I thank you Eric for that. 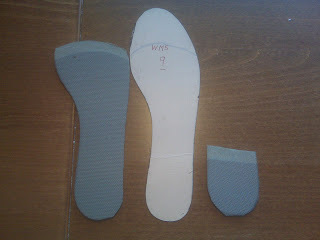 Steps at designing the right arch height for the Inverted Orthotic Technique. The photo above shows 3 positive casts all poured to vertical and then marked at two standard points: low point on the heel and bisection or low point on the first metatarsal head. These are two easily found landmarks. A ruler is then used to first find the bisection between these two points, and then a second point 1 inch closer to the heel. 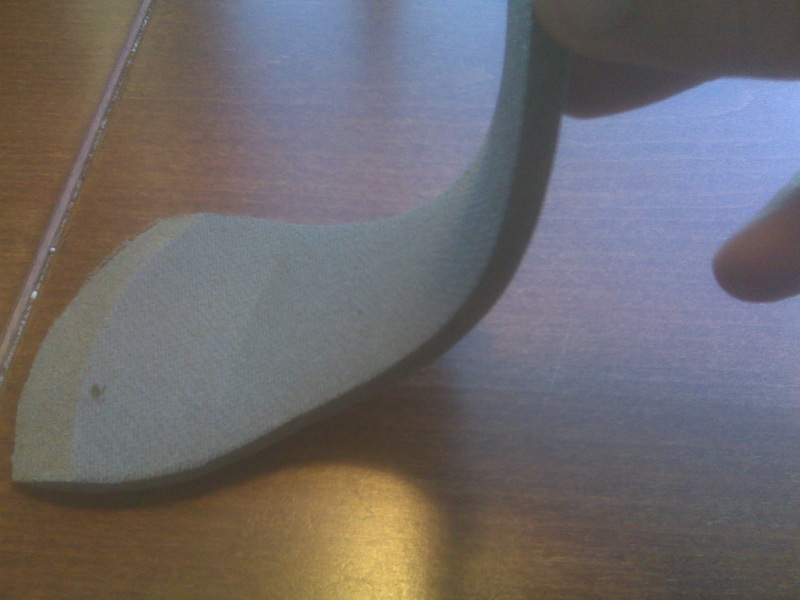 Here the wider line is at the bisection mark and a second mark is 1 inch more proximal (closer to the heel). As you will see by the photos that follow, it does not really matter that one inch is used on size 18 feet or size 7 as the extremes of the 3 feet I demonstrate. Now these lines are carried all the way medially and to the top of the positive cast. See these same marks applied to three different size feet. The biggest one is my son Chris. Now the casts are canted the desired degrees with the whole foot inverted. I will use the standard 25 degree inverted cant on all 3 casts. The two photos above show the nails used to invert these 3 casts 25 degrees each. Plaster is laid down to make an anterior platform. You can begin to see the Inverted cant being applied to the heel, arch, and forefoot. After the Inverted Cant is applied, plaster is worked into the arch to begin to create a supportive but comfortable product. It is very important to not lose track of those crucial arch lines while placing on the plaster. In designing the right arch height on the Inverted (or Blake) Orthotic Technique, you must remember the Golden Rule of Foot: The highest point in the medial arch is proximal to the first metatarsal (within the marked area). The area in front of these lines toward the big toe must drop smoothly (without high spots) to the platform. In this way, the first ray is allowed to plantarflex and there is no supination moment on the long axis of the midtarsal joint. You can see that the crucial area within the marked lines is relatively flat with an slight upward slope towards the big toe. See how the highest part of the arch is within the marked area. The plaster is very smooth in both directions from that point. There are no high spots under the first metatarsal to block plantarflexion of the first ray. There is tremendous medial heel and talo-navicular area for medial support to combat pronatory forces. Imagine the supinatory moment applied with this standard 25 degreee Inverted correction to the subtalar joint axis. With the Inverted Orthotic Technique, it is important to maintain the fifth metatarsal and most of the heel devoid of plaster buildup. 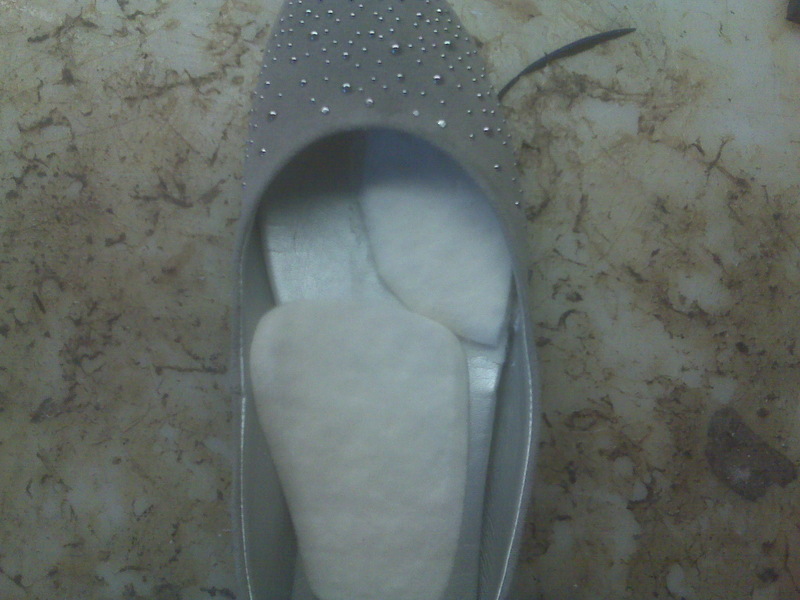 The lateral heel expansion should be 2 or 3 mm and follow the natural curves of the heel. 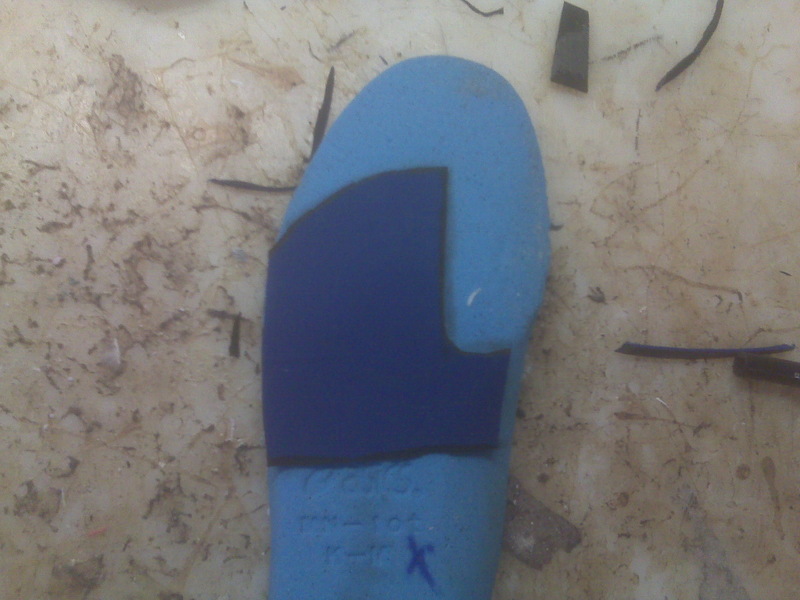 The lateral edge of the buildup should be straight with the heel and the fifth metatarsal should be the highest point of the buildup (lowest point when you turn the mold over). Here you can see with 3 different size feet that the marked area was the high point on the medial arch and the plaster fell smoothly away towards the big toe. The area marked is the highest part of the arch. The lowest points of the orthotic device will be the heel, the fifth metatarsal shaft, and the entire anterior platform which sets the Inverted Cant. The plaster must be a smooth transition from this marked area upwards towards the big toe, upwards toward the anterior platform, upwards towards the fifth metatarsal shaft and cuboid, and then smoothly blend with the heel. The heel area must be devoid of plaster as much as possible, with the lateral and posterior expansions 2 to 3 mm and following the curve of the heel. Thank you so very much, now back to my lab. The basic principles of Contract Relax Stretching are introduced in the above video. A specific demonstration of partnered hamstring stetching is shown. Contract Relax stretching technique can be used on any tight muscle/tendon group. The muscle is fatigued by alternating contractions against some resistance allowing for better stretching. This is the same basic principle of stretching that warming up a muscle/tendon will allow for a deeper stretch. In the partnered hamstring stretch demonstrated, the patient contracts the hamstring against the resistance of the partner's shoulder. Isometrics are normally done to a slow count of 6 with increasing strength as the count continues. During the stretch part, the partner gently and gradually stretches the hamstring to its endpoint. The same basic stretching principles as in the video link and text link below are followed including deep breathing, no pain while stretching, alternating sides, no bouncing, etc. Contract Relax Stretching can also be done solo to achieve better flexibility by creating a contraction followed by a stretch alternating program. For example, solo or unpartnered contract relax for the achilles can be an alternating program of 5 one-sided toe raises, followed by a 30 second stretch, repeated 5 times. I hope this introduces this powerful stretching technique to you, especially used in hard to stretch muscle/tendon groups.